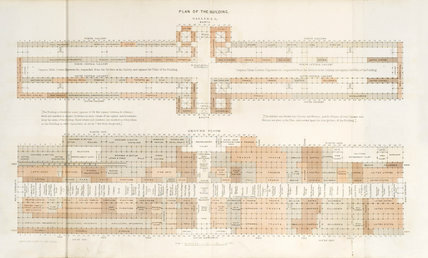 Plate showing the floor plan of the Great Exhibition, held in the Crystal Palace in Hyde Park in May-October 1851. The Great Exhibition was conceived by Prince Albert (1819-1861) to showcase Britain's technological achievements and demonstrate its industrial and economic superiority to the rest of the world. 'British Empire Exhibition', LNER poster, 1925. 'Conducted Rambles', SR poster, 1935. 'Shipbuilding on the Clyde', LNER/LMS poster, 1923-1947. 'Industrial Workshop (a steel works)', 1910.